Laughter and questions, that’s not always what makes up your traditional class, but that was what ensued when students had the chance to speak with the New-York Times best-selling author of their textbook, Jay Heinrichs. 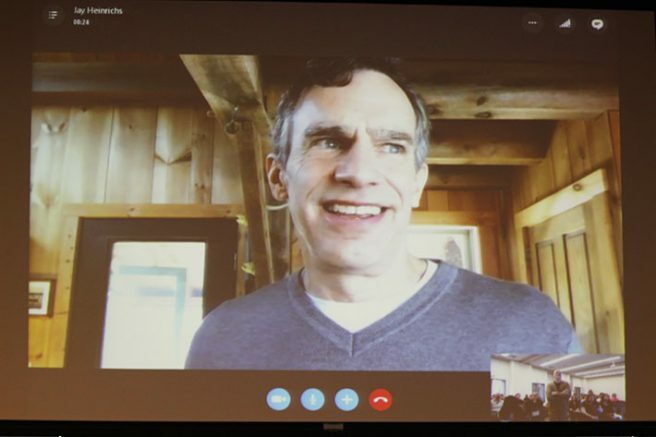 Heinrichs, the New York Times best-selling author of the textbook, “Thank You for Arguing: What Aristotle, Lincoln, and Homer Simpson Can Teach Us About the Art of Persuasion,” talked with students via skype on March 2. The session was mostly a Q&A format during which the students asked the author any questions they may have had. David Austin, professor of the Speech 302, Persuasive Speaking class in attendance, said he sought Heinrichs out for the call. This is the second time that Austin has had his class Skype with Heinrichs. The author also spoke to Austin’s class during the 2016 fall semester. It was very different this time, Austin said, because students asked different questions, so the discussions went in different directions than before. This is a new way for students to interact in class, he added, by actually being able to speak with the person who authored their textbook. “As a professor, I am trying to find new and innovative ways to attract interest in my students in course subject matter,” Austin said. Austin added that one challenge he faces as a professor is to do new things and to not allow his class lessons to get stale. When he first took over the Speech 302 class, he tried following the previous teacher’s footsteps but he quickly learned this was not his way, so he adapted the course. He began by asking himself, “If I were a student, what class experiences would make me want to come to class?” This is when he picked Heinrichs’ textbook for the class. “I chose a textbook that was funny; that students would want to read,” Austin said. He also said that most students keep the book once the class is over because of how useful it is. Juan Garcia, a General Science major, said he was happy to be at the event and to be able to talk to the author. “You usually read a book and wonder what the author was thinking, now you know,” he said. Students had many questions that ranged from relationship argument advice to what they thought the current U.S. president could do to strengthen his rhetoric skills. Heinrichs also gave students tips on what to do at job interviews. “Ask questions,” Heinrichs said. He then jested that by saying as little as possible and the interviewer will think you’re brilliant. Heinrichs implored students to contact him to follow up on the questions they had by giving out his email. Austin says he plans to offer a similar experience next semester; the class is currently scheduled to meet in the fall from noon to 1:30 p.m on Tuesdays and Thursdays. Be the first to comment on "Students skype best-selling author"